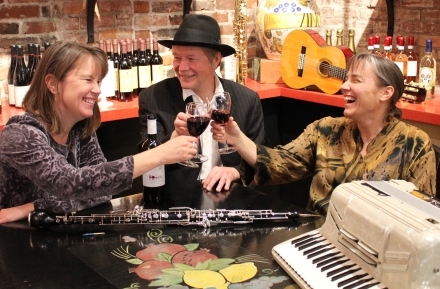 The Terra Nova Trio will be making their first appearance in Kathy Parsons’ MainlyPiano House Concert series on Sunday September 30th at 3:00 PM. Offering a fresh vision of concert programming, the Terra Nova Trio is a new ensemble in its third season with players from the Eugene Symphony and the Oregon Bach Festival. With their traditional classical instruments (oboe, bassoon, and piano), they bring Bach and modern French composers to life. With their popular instruments (sax, guitar, and accordion) they generously mix in klezmer, tango, blues, and exotic originals. The result is a satisfying new world of possibilities. The Trio is Annalisa Morton, who plays Principal English horn in the Eugene Symphony and teaches oboe and English horn at Oregon State University in Corvallis and privately in Eugene. She is currently a member of Oboe Madness and The Left Coast Sax Quartet, both of which feature an eclectic mix of world music, jazz, & classical; Mike Curtis, who plays bassoon, clarinet, and saxophone, is equally at home within classical, ethnic, and jazz traditions. He currently plays with the Eugene Symphony; and Sandy Holder, who has worked with the Oregon Bach Festival, Eugene Symphony, Eugene Opera, Oregon Symphony, Eugene Children's Choirs, Oregon Festival of American Music, and the Oregon Mozart Players as well as performing in numerous recitals at Lane Community College, the University of Oregon, and various symposiums and conferences. She is an instructor at Lane Community College, a member of the Oregon Music Teacher’s Association and also has maintained a private teaching studio in Eugene since 1993. Reservations are required by emailing Kathy Parsons at kathypiano@gmail.com. The address and directions will be given when reservations are made. All donations go to the artists!